Why Is Israel Kicking Out the Africans? 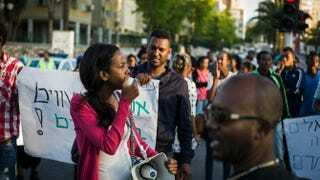 Ethiopian Jews demonstrate against police violence and racism in the third of such protests May 4, 2015, in Kiryat Gat, Israel. The previous Sunday, thousands of Ethiopian Israelis blocked major roads and clashed with police in Tel Aviv after a similarly violent protest took place in Jerusalem following the release of a video showing police brutally beating up an Ethiopian soldier with the Israel Defense Forces. A few days into an educational trip to Israel in 1991 shortly after the mass airlift of Ethiopian Jews into the country, my jaw dropped when a Jewish official casually described the arrival of the Ethiopians as an opportunity to beef up Israel’s Olympic running team. More than two decades later, and it appears that probably didn’t work out. Israel now seems more anxious to give its sizable black African migrant population the boot. At the moment, the focus is much less on settled-in Ethiopian Jews and more so on Sudanese, Eritrean and Ethiopian Christians fleeing war, persecution and poverty at home. And, naturally, if you’re a poor African migrant looking for work, you’re headed to Israel, a top 40 country in terms of gross domestic product and the closest, most powerful, democratic, free market economy you can find within regional distance. But now, turn back: because if you’re a black undocumented migrant, Israel is giving you 30 days to get gone. In a bid to put a humane face on it, Prime Minister Benjamin Netanyahu’s government is putting money where its racially charged mouth is. An estimated 45,000 Eritrean and Sudanese refugees not only get a free, no-return ticket back home (or to some “unnamed” African nation) but also get sent with $3,500 in their pocket. That might not seem like such a bad deal, some might say. After all, what other country (including the United States) deports its undocumented migrants with game-show-like cash offers? But throughout the Euro-influenced parts of the Mediterranean, there’s been a discomforting trend of countries like Israel, Italy, France, Spain and others taking extreme military-enhanced measures to keep the Africans out. Part of it (cutting European countries some slack) has to do with an uncontrolled tsunami wave of North African and sub-Saharan African migrants crossing dangerous Mediterranean waters to escape destabilization spreading throughout parts of Africa. Libya, with its former despot Muammar Qaddafi deposed by a U.S.-led effort in 2011, is now a bubbling cesspool of factional violence. Terrorism is spreading into the continent, and civil wars remain unresolved in places like Sudan, Mali and elsewhere. Climate change and economic disruption are also spreading resources thin, prompting many Africans to look for lands of milk and honey farther north. Gripped in a debilitating debt crisis of its own, Europe is just not having that. The European Union, also fearful that hard-to-detect Islamic State group and al-Qaida operatives will slip in, just asked the United Nations Security Council to authorize a major military-style campaign against seafaring migrant smugglers before they pick up refugees. The situation in Israel also appears equally complicated and racially challenged. Plans to push African migrants out of the Holy Land had been stirring for some time as Israel built new fences and detention centers along its southern borders. Netanyahu’s government claims it’s all about keeping black migrants safe from deadly desert crossings. But the U.N. refugee agency pushed back on that, accusing Israel of “creat[ing] fear and chaos amongst asylum seekers” and dangerously teetering on the edge of an international refugee-treaty violation. No surprise, then, when Israel, probably fearing how anti-Africa it looked, later announced the deployment of three “mobile emergency clinics” to fight Ebola in West Africa. Charges of racial discrimination are a heated and very complicated topic for Israel, especially when considering the Jewish state’s own origins as a destination point for European Jews escaping genocide after World War II. And critics are quick to point out hints of hypocrisy in the black-migrant deportation policy or the expectation that Israel should be the last place oppressing populations of color. Recent #BlackLivesMatter-style protests organized by Ethiopians in Tel Aviv underscore an embarrassing undercurrent of discrimination in a society popularly viewed as Jewish but racially as majority white. And with that comes familiar white-people-prompted problems. Israeli Ethiopians face challenges similar to those of African Americans in the United States: from high unemployment to police brutality and rampant incarceration. Some critics, like black British filmmaker Ishmahil Blagrove, charge that the Israeli prison system is 90 percent black. Others, like Forward’s Seth Frantzman, point out that Israeli Defense Forces military-prison populations are 40 percent Ethiopian, or “760 percent higher than their proportion in society.” Israel, always in a state of war, mandates compulsory military service from its citizens. There’s been a troubled history of Israel’s policies toward African migrants, including the treatment of once wildly embraced Ethiopian Jews who arrived by Operation Solomon in the early ’90s fleeing anti-Jewish persecution. Worries mount for Israel as its Jewish majority sweats a fast-growing non-Jewish Arab population and the presence of nearly 100,000 non-Jewish African migrants challenging the stability of the country’s relatively tiny population of 9 million. At some point, Israel has to find a solution as it frets over nonstop national-security issues. But given its history, it should probably ease up on black migrants, who, ultimately, had little to do with that in the first place.